When deciding on a career or next step in the array of work and/or study opportunities, it’s logical and reasonable to ask the question: What would you like to do? This can be easy for some to answer, but it’s not always most helpful to finding suitable work. Many teenage aspirations are arguably unrealistic; according to the Education and Employers Taskforce, actor was the most popular job 13-14 year olds wanted (maybe it’s changed to singer now that X Factor is back on our screens…). The more reality TV there is – the more reality checks we seem to need. Haven’t we got enough of these ‘stars’? It’s not surprising that jobs sought in media and sport industries are over-subscribed. These are some of the jobs that we are most exposed to in popular culture; here we have the availability heuristic at play (whereby the most readily available information is used to guide decisions), alongside selective abstraction of those exciting or interesting elements of jobs. For example, when watching TV we are seeing the ‘final product’ of programmes and sport rather than the less glamorous efforts that had to occur to make them possible. Whilst being aspirational shouldn’t be quashed, balancing it with reality and ‘the bigger picture’ is important. This will help to prevent disappointment when idealised expectations cannot be realised, as well as allowing lesser-known areas of work to enter more into the foreground of possibility. I remember my more naïve and younger self having an informal interview for a runner at the BBC, ironically being drawn to this because it looked like an exciting opportunity; I was probably victim to all the idealised aspirations mentioned above. Whilst I didn’t get the job, I do remember well one of the questions posed and my instinctive response. The question was: What do you think is the best job to have? At the time I struggled to think of one job that seemed to ‘have it all’, so I opted for the response that all jobs have good bits and not so good bits and it’s about making the most of each. Thinking on this now, perhaps it’s about the ratio of good to not so good; the overall reason and purpose of choosing a particular line of work; the context and people with whom you work. In what environments do you prefer to work? – Alone or with others? – With your ideas or your hands? – With things or people? – Following or making rules? 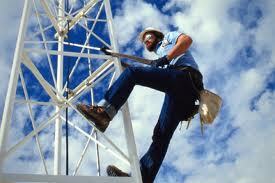 Reach for the blue sky: what about a career as a Tower Technician? As for matching your answers to career options, beware the biases: you will recall those options with which you have been exposed. Make sure to find out about the lesser-known options, both in theory and what this might be like in practice.